Earlier this week, a work colleague, uncomfortable with natural silences, forced a comment that he never knew would create such a fiery response: ‘With the arrival of autumn, things must be grinding to a halt for you gardener types?’ Stretching to full height and meeting him mano a mano, I could tell he immediately wished polite conversation had never been invented. Like so many people, he had no idea our busy little friends were in so much trouble. So I explained the different reasons for their decline: agricultural development, pesticides, natural habitats given over to building contractors looking for their next paycheque. Even residential front gardens being dug up and replaced with stone and concrete driveways to park more cars on and keep neighbours’ curtains twitching. 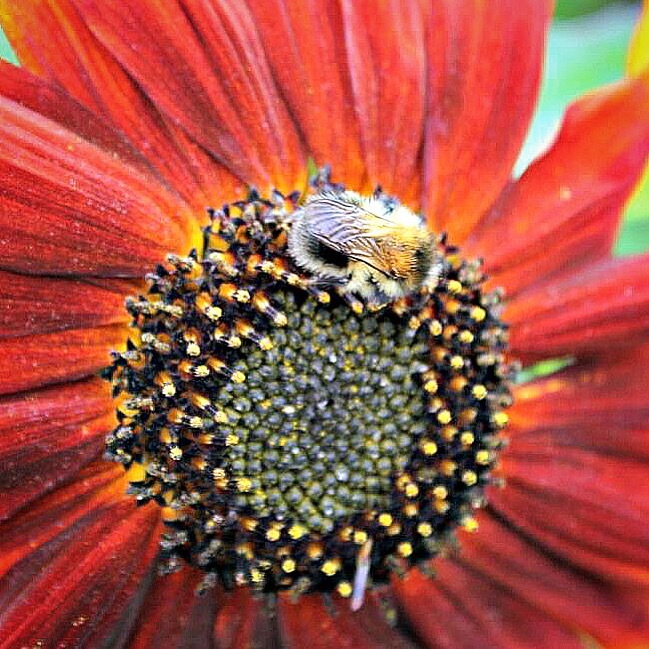 I’m a big fan of the bee, and this year I gave so much of the garden over to them by planting numerous bee-friendly plants. In the mornings before work, I would stroll up my garden path, only to watch these tireless creatures going about their business; it was truly hypnotic. And as they bring me so much pleasure, the least I can do is show my appreciation for them. Every year, normally in October, I ensure I have logs, a few homemade bee hotels, bamboo and hideaways in the garden for our pollen-loving chums, so they can safely wait out those chilly months before making a welcome return next spring. Up on the allotment, I’ve created a mound surrounding my plot to encourage both bee and other bugs to nest, feed and generally feel protected. Our countryside has changed drastically in the last fifty years, what the next fifty years hold is worrying to say the least. 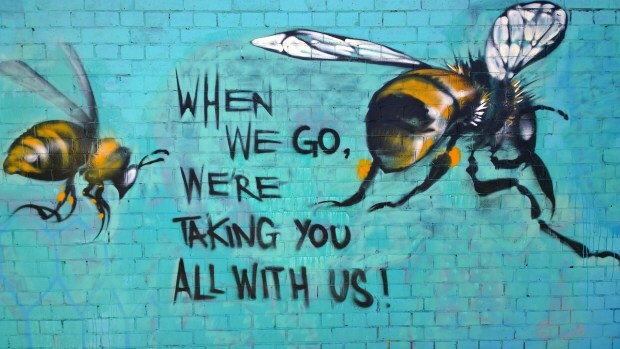 Bees are the key link in nature and the food chain, and we need to let them know they matter. 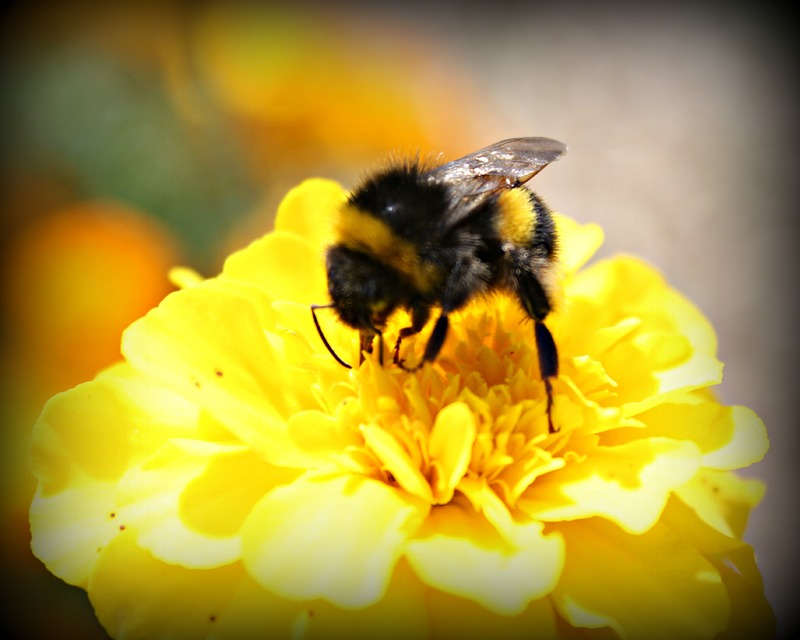 If you have a little time and a little space, please give a bee a home. Better still why not take a look at what you can do for them here. They won’t make a mess, never talk back and are always home before dark. Sound like the perfect lodgers to me. Well done. Yes I know that glazed look that comes over the wary non-gardener but also the importance of bees. Keep reminding them. Yes, let’s hear it for bees! (However, it sounds as though your co-worker heard far more than he had bargained for.) I’m happy to report the bees are thriving at the little house in the big woods. Nicely written and THANKS for the bees! Actually have the same blue-ish pic on my computer. If people would just start to understand how important these little friends are… best to you and Sophie!